Siemens has recently released the embedded video showing the making, transport, and assembly of the world’s largest wind turbine blade, which is also the world’s largest component made of fiberglass. The blade is 75 meters or 246 feet long and has no seams or splices. The blades, which are for the newest 6-megawatt wind turbine, are now being tested in the Danish Østerild. It is intended that the massive blades will become the work horses of future offshore wind farms. These wind turbines are so big that they are able to have a helicopter platform at the top of them, so maintenance can be more easily carried out. 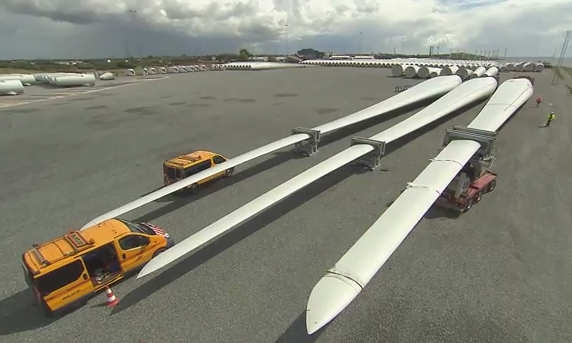 Looking at the huge blades, you would be forgiven for thinking that it would be impossible to transport the 75 meter, 25 ton blades by road, but as you will see from the video, although difficult and quite the public spectacle, it’s entirely possible. Massive blades like this can generate a lot of energy from the wind, but they also have to withstand a great deal of force when mounted to the rest of the turbine. As explained in the video, where the blades join to the rest of the turbine, the load is equivalent to having a 100 meter fishing rod with 30 medium sized family cars at the end of it; which goes to show, these turbines have to be very, very strong!